Point location itself is complex and takes many years to master, but there are some points that can be used successfully with basic acupressure techniques. The acupoint that follows doesn’t solely rely on an in-depth diagnosis to prove beneficial. Of course it's best to visit your acupuncturist first to determine the best course of treatment for your particular condition. Can’t sleep? Feeling nervous or anxious? Heart 7 (pictured) is known in Chinese as Shen Men and translated as Spirit Gate or Mind Door, this acupoint is often used to strengthen the mind and to reduce heart palpitations. It’s located on the wrist crease, in line with the little finger, and in my experience is very effective for calming the mind, soothing anxiety and combating insomnia due to an over-excited mind. 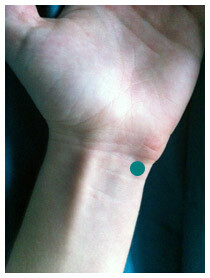 Simply apply light pressure and use a gentle circling motion with your index finger or middle finger over the point highlighted in green on our picture. This can be done quite discreetly during times of anxiety or nervousness, perhaps during an event or function. Also, as mentioned above, if you wake in the middle of the night, try this to help you rest and relax. Aim to spend at least 5 minutes massaging Heart 7, but use only when needed. I hope you find this useful and please feel free to share this post with anyone who may find it of benefit. If you’d like to explore further treatment with acupuncture, please give The Mitchell Hill Clinic - Acupuncture & Natural Health Centre in Truro a call on 01872 274774 or visit our website to book online: www.themitchellhillclinic.co.uk I also offer free 15 minute consultations should you wish to find out how acupuncture may help you. In no circumstance should the information contained on this blog be used as a guide for medical practice or purpose. If a medical condition is suspected then you are advised to consult a medical practitioner, particularly if you are on orthodox medication.